View of a house (possibly a coaching inn) in Exeter. It is thought that there was a Celtic settlement here but the area was first developed by the Romans. Exeter was important because it is this location which is the lowest point at which the River Exe could be crossed. By the 18th and 19th centuries Exeter had flourished as a port and although industries such as woollen trade had started to decline by this time many wealthy families had been attracted to the city. 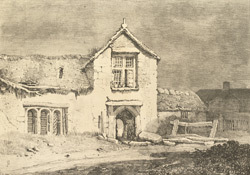 Thatched roofs like that of the house in this engraving were common across the country in the 19th century. There were regional variations and in the West Country combed wheat reed roofs were most popular.